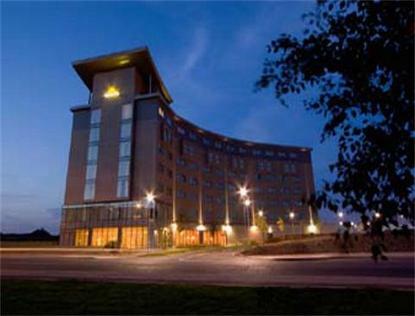 Days Hotel Park West first opened its doors in September 2006. This premium 3 Star Hotel and 5 Sunburst comprised of 146 beautifully appointed rooms with ensuite power showers, Tea and Coffee making facilities, complimentary Wifi and Broadband internet connections, Hypnos Beds for that perfect nights sleep and full size Irons and Ironing Boards. Hotel also offers complimentary in room lap top size safes, cable TV with built in DVD player. Ruebens Cafe bar is located on the on the ground floor area and offers a wide range of food including breakfast, lunch and dinner. The Hotel also boasts 6 meeting rooms, 4 boardrooms and one large facility that can be used as one or two large rooms, all meeting rooms are equipped with state of the art AV equipment. The Hotel also has a large car park which is complimentary to all our guests.